The 2018 Beijing Summit of the Forum on China-Africa Cooperation (FOCAC) will be held in Beijing on September 3 and 4 under the theme "China and Africa: Toward an even stronger community with a shared future through win-win co-operation". Chinese President Xi Jinping will chair the summit and host relevant events. Leaders of the FOCAC African members will attend the summit upon invitation, and representatives of relevant regional organizations in Africa and international organizations will also participate in related activities. 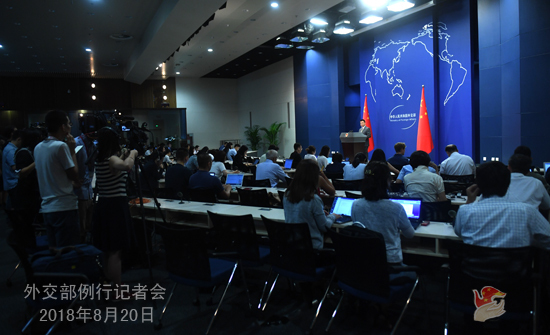 The Foreign Ministry will hold a press briefing in Lanting (Blue Hall) at 8:30 on August 22 (Wednesday). State Councilor and Foreign Minister Wang Yi will be present to brief the press on the 2018 FOCAC Beijing Summit. Assistant Foreign Minister Chen Xiaodong will also join us in the Q&A session. Your participation is most welcome. For your information, the official website for the media center of the 2018 FOCAC Beijing Summit (www.focac2018.com) went into service at 8:00 this morning. You may refer to it in case you need some information. At the invitation of Minister Tsogtbaatar Damdin for Foreign Affairs of the State of Mongolia, State Councilor and Foreign Minister Wang Yi will pay an official visit to Mongolia from August 23 to 25. Q: Former UN Secretary-General Kofi Annan passed away at the age of 80 on August 18 in Switzerland. How does China comment on Mr. Annan? Has China expressed condolences? A: China expresses its deep condolences to the passing of former UN Secretary-General Kofi Annan and our sincere sympathy goes to Mr. Annan's family. Chinese President Xi Jinping has sent messages of condolences to UN Secretary-General António Guterres. Mr. Annan was an old friend of the Chinese people. As an outstanding and world-famous representative of the African people, Mr. Annan had been campaigning around the world. His work strengthened people's trust and confidence in the UN and garnered more attention and input from the international community onto Africa. We believe that his endeavors and contributions will be forever remembered by all. Q: US Secretary of State Mike Pompeo announced the establishment of the Iran Action Group to step up pressure on Iran. What is China's comment? A: We have noted relevant reports. I believe you are well aware of our position on this. 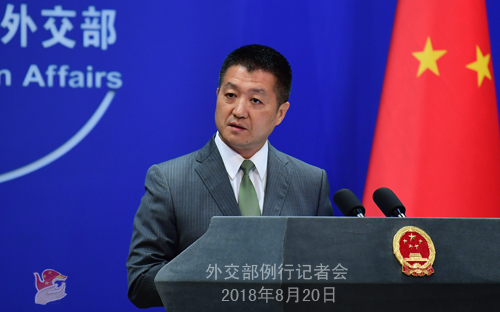 China always maintains that disputes between states shall be addressed through dialogue and we oppose the reckless imposition of unilateral sanctions or threatening to do so. The situation in the Middle East is highly complicated and sensitive at the moment. We hope that all relevant parties could bear in mind the interests of all the people living in this region and contribute to regional peace and stability. Q: There are reports that President Xi Jinping will visit the DPRK next month. Can you confirm it? What is China's expectation for the denuclearization process of the Korean Peninsula? A: I will take your second question first. The Chinese government has been making unremitting efforts for the denuclearization of the Korean Peninsula and peace and stability in the region. The international community will give us credit for that. As for your first question, China and the DPRK are friendly neighbors, and the two parties and two states have been in friendly exchanges. I have no information to offer for your specific question. Q: Reports say that the three-day reunion of separated Korean families kicked off today at the DPRK's Mount Kumgang. What is your comment? A: We have noted relevant reports. We are glad to see the resumption of the reunion activities of separated families after a lapse of over two years. The DPRK and the ROK are of the same ethnic group bound by blood. Both sides are actively implementing the consensus reached by their leaders, following the spirit of the Panmunjom Declaration and continuously promoting reconciliation and cooperation. This is conducive to cementing their mutual trust and improving their relations, and will play a positive role in sustaining and consolidating the improving situation on the Korean Peninsula. 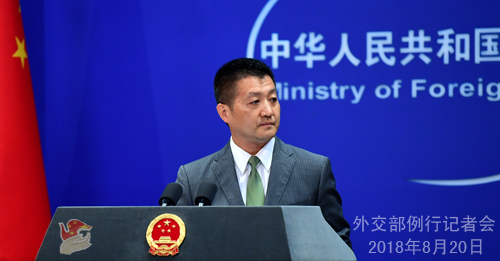 China will continue to fully support the DPRK and the ROK in improving their relations. We also hope that all relevant parties of the international community could be generous with their encouragement, thus creating favorable atmosphere to sustain the momentum for dialogue, advance the denuclearization of the Korean Peninsula and move forward the political settlement process of the Korean Peninsula issue. Q: Chairman of Tehreek-e-Insaf (the Justice Movement Party) Imran Khan has taken oath as the new Prime Minister of Pakistan. In his victory speech, he particularly emphasized the importance of China-Pakistan relations and he also mentioned the China-Pakistan Economic Corridor. What is your comment please? A: We have already sent out our warm congratulations to Mr. Imran Khan on his election as the Prime Minister of Pakistan. We value and appreciate Prime Minister Imran Khan's positive remarks on China-Pakistan relations and the China-Pakistan Economic Corridor (CPEC). China and Pakistan are all-weather strategic partners. We stand ready to join hands with the new Pakistani government to enhance friendly exchanges and cooperation across the board, accelerate the advancement of CPEC and move forward the China-Pakistan all-weather strategic cooperative partnership. Q: AFP recently reported on the remarks by the Prime Minister of Tonga concerning his country's debts to China. That report has attracted some attention. What is your comment? A: We have noted that the government of Tonga issued a statement on August 17 to clarify the relevant report, and Prime Minister Pohiva himself also cleared up his remarks in an interview. They all spoke highly of China-Tonga relations, expressed their great appreciation to China's recent years of assistance in various forms, and made clear that the Pacific Islands Forum is not a proper venue to discuss the debt issue and that Tonga and China will properly resolve the relevant issue through friendly consultations via bilateral channels. I would like to stress that China and Tonga are strategic partners that respect each other and seek common development. China will continue to do its best to support and assist Tonga and other Pacific Island countries in their pursuit for sustainable development. Q: China announced that its delegation will visit the United States for trade talks at the end of August. Do you have any specifics on the actual dates and schedules of that visit? A: The Commerce Ministry of China issued a pretty clear statement. I suggest a little more patience on the release of further information. Follow-up: Do we have any dates for it? A: At the invitation of the US government, Vice Minister of Commerce Wang Shouwen will lead a delegation to the US and have talks with the US delegation led by David Malpass, the US Treasury Department's Under Secretary for International Affairs, on how to properly resolve trade issues between the two sides on the basis of mutual respect. We hope that the talks between the two sides on the basis of reciprocity, equality and good faith could lead to good results that meet the interests of the Chinese and American people and live up to the expectations of the international community. Q: The Chinese Defense Minister is due to visit India in the coming days. Do you have details? How do you see the significance of his visit to India? A: The relations between China and India have been improving for some time, and progress has been made in bilateral exchanges and cooperation on various fronts, including high-level military interactions as you mentioned. As for the specifics, I would refer you to the Defense Ministry. Q: Taiwan's leader Tsai Ing-wen has visited NASA's space center. What is your comment? A: With regard to the Taiwan's leader exploiting all kinds of excuses to justify her foreign trips and separatist activities, the Chinese side has made its stern position clear to relevant countries that we oppose offering convenience and avenue for such activities. As for the specific case you mentioned, I can tell you unequivocally that we have made clear our stern position to the US side. We urge the US to stick to the one-China principle and the three joint communiqués. The Taiwan separatist forces should not be aided nor have any space on the international stage. We firmly oppose any country that has diplomatic ties with China engaging in any official interaction with Taiwan.